i have two sets of data for one graph, and use two different data point symbols. to make the graph more intuitive, i’d like to add the symbols to the axis labels, e.g. the addition of the correct symbol is apparently easy using legend(), but i want to add it directly to the axis label. when plotting my data, i disable the automatic creation of axis labels (… xlab =””, ylab=””, …) and add my own label text later. in order to use symbols (bullet points and circles in my case; also applies to other symbols1), i eventually resorted to a combination of text(), Hershey Vector Fonts and graphical parameters such as cex (character expansion, for bigger font size), adj (string align) srt (string rotation) and xpd (plot/clipping adjustment). for further information, refer to the manual: R: Hershey Vector Fonts in R.
for lists of hershey vector font codes, have a look at the R Graph Gallery. unfortunately, there are a few limitations to this approach: hershey code is (for now) only interpreted within the text() function, not with xlab, ylab or mtext(). 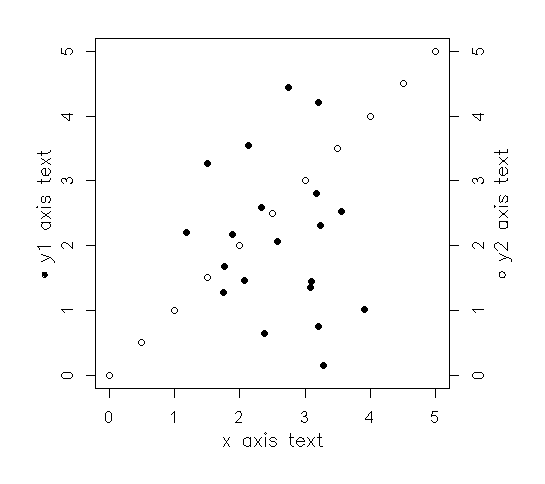 also, if you're creating a multi-graph plot with mfrow or mfcol, text is usually clipped at the margins of each individual graph. this means, that if your axis label text is too long, it will be clipped at the beginning and end. a line-break will probably omit that, but that doesn't seem to be a clean solution.